This large boulder was dropped in place by an ancient glacier, which carried it from afar. Living things are given a scientific name consisting of two names, a genus name and a species name (called a binomial), from Latin or Latinized Greek. These two names together are always placed in italics. Only the genus name is capitalized. Common names may be capitalized, or not. When you see a list of species, such as these maples, only the first mention of the genus name is written in full. Using a field guide or an online search, identify the trees and birds you see around you during the day. Write out their common names and binomials, accurately. 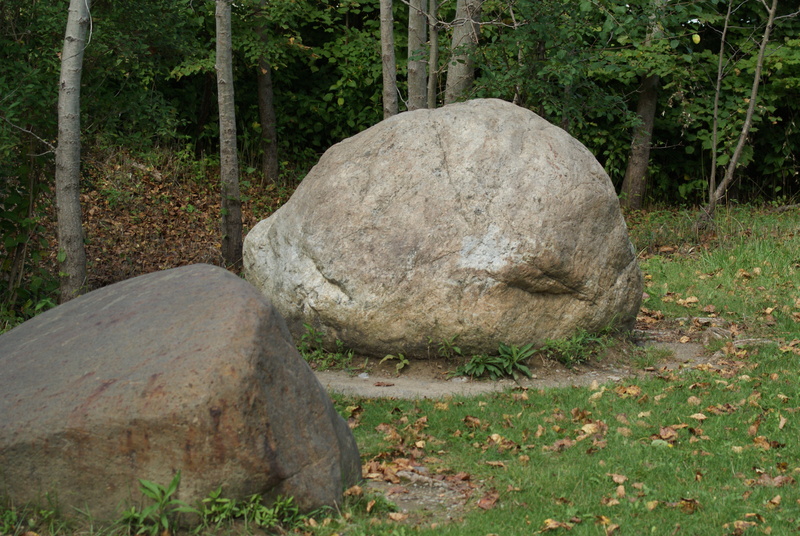 Glacial erratics are rocks, often large boulders with a rounded shape, carried and dropped in unusual places by a glacier.